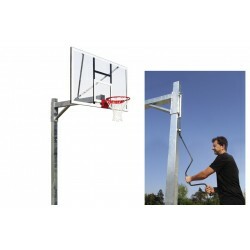 Pole: made of 120 x 120 x 4 mm square tube, powder coated, with 160 cm extension with height adjust mechanism from 260 to 305 cm. Transparent backboard model 153: made of 10mm thick Plexiglas, size 180 x 105cm, target and border lines painted in white, the backboard is set into aluminium frame. Flex Goal model 235: brake Away system (gas spring with force 2200N), brakes at about 35 kg. European hole pattern 110 x 90 mm. Made of full steel rim ø15 mm. Side collar made of 3 mm thick steel, 6mm thick back plate. Powder coated. Complete with net (12 loops).